Exquisite tastes of Izmir, a member of DELICE Network of Gourmet Cities, were brought to the table at the International Gastronomic Tourism Congress. The congress which was held at Fuar Izmirwas a sight to see with different booths offering different tastes. Jean Michel Daclin, President of DELICE Network of Gourmet Cities, said that the rich cuisine culture of Izmir definitely needed to be used in promoting the city. 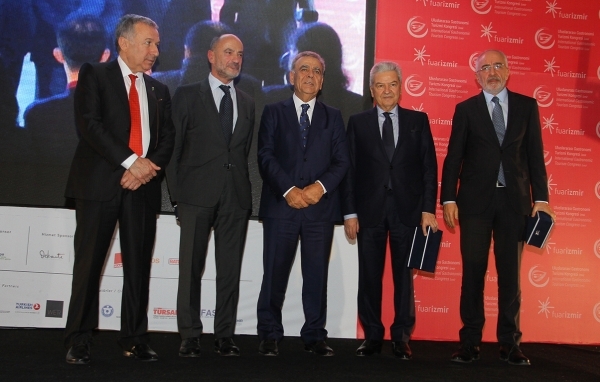 The International Gastronomic Tourism Congress, co-organized by Izmir Fair Services Culture and Art Affairs (İZFAŞ), Convention and Visitors Bureau, Izmir (CVB), Association of Turkish Travel Agencies (TÜRSAB), and Izmir University of Economics Department of Culinary Arts and Management, brought leading names of gastronomy and tourism experts and educators together. The relation between Aegean culture and gastronomy, its effects on the development of regional tourism were discussed at the congress. Ekrem Demirtaş,Chairman of the Executive Board of Izmir Chamber of Commerce (ITO) and President of Izmir University of Economics, stated that the first congress gained a significant meaning by the attendance of Jean Michel Daclin, President of DELICE Network of Gourmet Cities.Demirtaş said that it was not easy for Izmir to join Network of Gourmet Cities formed by 24 leading cities from 4 continents, that the network was very selective when it came to new members. President Demirtaş said, “We want to promote Aegean to the whole world. There are Chinese, Italian restaurants worldwide, why wouldn’t there be Aegean restaurants. We can open up Aegean restaurants in important centers worldwide in time. We want to have a say in gastronomy worldwide by highlighting our values with the support of Izmir Metropolitan Municipality”. Başaran Ulusoy, President of Association of Turkish Travel Agencies (TÜRSAB), said that Turkey offered very delicious tastes from all of its regions, and Aegean region particularly had a significant place. He said that they, as tourism professionals, wanted to reflect this richness onto tourism and turn this into economic gain. IUE Rector Oğuz Esen and Hande Arslanalp, Member of the Organizing Committee, said that Izmir had a great potential and the congress would help draw a road map to assess this potential.